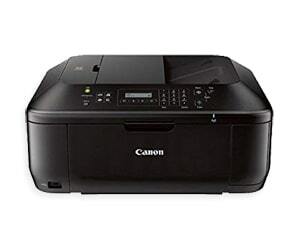 Canon PIXMA MX459 Wireless Inkjet Office All-In-One with the Compact provides high-quality performance. Easy-to-finish task stack of Office or Home business. With built-in Wi-Fi for printing, scanning anywhere, from your computer / mobile device compatible. Also includes AirPrint even lets you print wirelessly from iPad/iPhone or iPod touch device. Standard Interface Wireless LAN (IEEE 802.11b/g/n) / USB 2.0 Hi-Speed / Bluetooth v2.0 (Optional). High-quality printing delivers maximum print resolution Color Up to 4800 x 1200 dpi / Up to 600 x 600 dpi (Black). Print speed (Approx) Black ESAT 9.7 ipm / Color ESAT 5.5 ipm, produces brilliant quality photos or documents clear sharp text. Ink Compatibility (PG-240XXL XXL Black Ink / PG-240XL XL Black Ink / PG-240 Black Ink / CL-241XL XL Color Ink / CL-241 Color Ink). Integrated 30-sheet Automatic Document Feeder speed up copying, Faxing capabilities, even FastFront system also makes changes to the ink, paper, efficient and easy. PIXMA MX459 Scanning element, contact image sensor, Network Scan / Auto Scan Mode / Scan to Memory / Push Scan, improve the quality of the original scan resolutions (Optical) Up to 1200 x 2400 dpi / Up to 19,200 x 19,200 dpi Interpolated / ADF Up to 600 x 600 dpi (Optical). Color Depth 48-bit internal/24-bit external / Max. scan document size (Flatbed) 8.5 x 11.7 / ADF 8.5 x 14.